Whether you’re looking for a domestic or commercial digital aerial, the Dale Comm team is here for you. We can provide a complete range of aerial installation in York and the surrounding areas. Our professional aerial fitters in York can install aerials of all sizes to a variety of properties. If you’re looking for a specialist, professional team to install tv and digital aerials of all kinds, get in touch today. The experienced team of aerial fitters at Dale Comm can install and fit a variety of tv aerials to all manner of properties in York. As part of our complete service, we can provide commercial and domestic tv aerial installation across York and the surrounding areas. We’re here to help our clients enjoy a range of high-quality, reliable TV channels from across the world. For specialist aerial installation and aerial fitters, get in touch with the Dale Comm team today. Over the years, the Dale Comm team has helped homeowners and businesses to enjoy a wide range of terrestrial and digital channels from across the world. As part of our complete services, we can provide domestic and commercial aerial installation in York for all manner of properties. Whether you’re looking for a subtle aerial installation on a traditional property, or a modern aerial for increased clarity, we’re here to help. Once our engineers arrive at your property, we will carry out a complete survey to help you discover the best aerials for your home. Once we’ve found the perfect aerial to deliver the clearest image, we will create a plan to install your chosen aerial. We will install your new aerial in the best possible location for it to deliver a long-term, reliable service. Aerial Installation Inside Lofts & Attics. For Your Free Quote, Call Our Aerial Fitters in York! If you’re struggling with an irregular or unclear signal from your TV aerial, upgrading to a modern aerial could fix your problem. 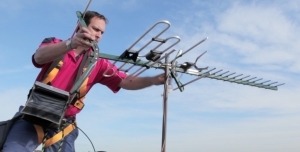 We can work to install a wide range of new aerials and ensure that your older, unreliable aerials are replaced. Even if you’ve gotten used to your older aerial, taking advantage of modern aerial installation in York can still offer a range of benefits. What are the Benefits of Effective, Modern Aerial Installation in York? A Wide Range of Terrestrial & Digital Programming – Thanks to the benefits provided by modern aerials, you’ll be able to enjoy a variety of diverse programming. Our digital tv aerials can pick up both terrestrial and digital channels in York. If you want to enjoy a wide, diverse range of programming at the same high-quality, choose Dale Comm today. Clear Programming Signal – Whereas older aerials often lose signal, or deliver an unclear picture, modern aerials are designed to provide clarity. Thanks to the high-quality modern aerials in York our team can provide, you’ll be able to enjoy a range of programmes at an extremely high-quality. For reliable access to a range of channels, call Dale Comm. Whether you’re looking for an experienced team of domestic or commercial aerial fitters in York, Dale Comm is here for you. With more than 25 years’ experience behind us, we can safely and quickly complete any aerial installation in York. Over the years, our team have provided all kinds of homes and businesses with access to high-quality, clear and reliable television programming. For more information on our complete range of aerial installation in York to suit your needs, get in touch today. Simply call our experienced engineers today on 0800 633 5311. If you prefer, you can also use our simple online contact form, and our experts will get back to you as soon as we can.